SIB Probationary Officer (PO) 2018 Final Result Check Here. SIB Probationary Officer (PO) 2018 Result Check Here. SIB Probationary Officer (PO) 2018 Admit Card Check Here. SIB Notification is out. 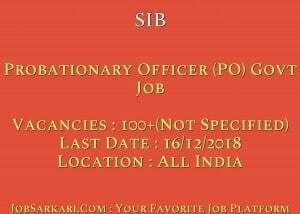 SIB is recruiting for 100+(Not Specified) Probationary Officer (PO) Govt Job 2018 Final Posts. 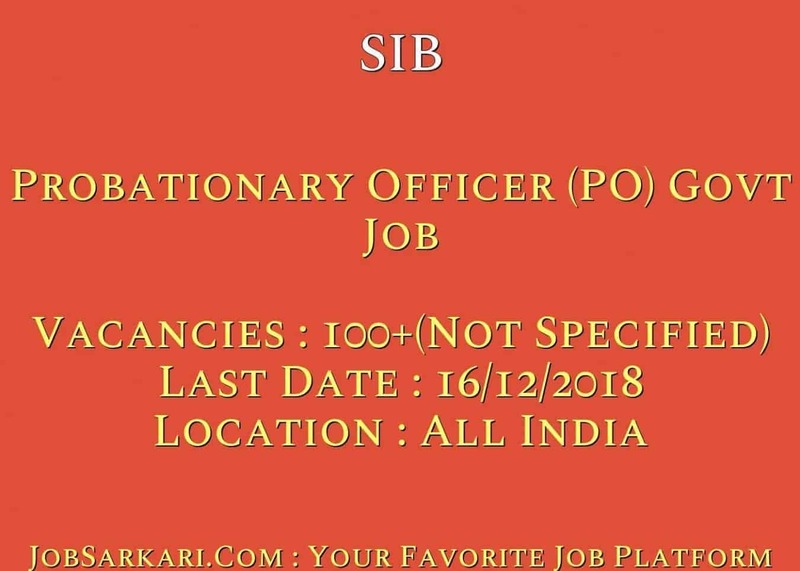 You can check SIB - South Indian Bank last date, download SIB notification, visit SIB official website and check other SIB Vacancy details.Complete Vacancy and recruitment Details about 100+(Not Specified) Probationary Officer (PO) Govt Job 2018 Final vacancies in SIB are provided below by JobSarkari.Com only for you. Last Date for Apply Online 16/12/2018. Date of Online Test 29/12/2018. Probationary Officer (PO) Candidate Must Have Passed Class 12th and Graduation With 60% Marks. 100+(Not Specified). Not Exceeding 25 Years as on 30/11/2018 (Upper age limit will be relaxed by 5 years in the case of SC/ST candidates). 3.After Successful Registration Login to Complete Your Application Form. 7.Online Application Can be Submitted on or Before 16th December 2019. Q. What is the Last Date For SIB Probationary Officer (PO) Govt Job 2018 Final Vacancy ? A. Last Date for SIB Probationary Officer (PO) Govt Job 2018 Final Posts is 16/12/2018. Q. What is the Form Type of SIB Probationary Officer (PO) Govt Job 2018 Final Recruitment ? A. The Form Type for SIB Probationary Officer (PO) Govt Job 2018 Final Posts is Online. Q. How many vacancies are available in South Indian Bank Probationary Officer (PO) Govt Job 2018 Final Posts ? A. There are about 0 Vacancies in South Indian Bank Probationary Officer (PO) Govt Job 2018 Final Posts. Q. What is the Full Form of SIB ? A. Full Form of SIB is South Indian Bank .